Take a bowl add plain flour,turmeric, oil & make a soft dough. Rest the dough for 30 mins. Soak the saffron in 2tbsp hot milk. Heat the pan, add grated coconut, sugar and mix well. Add saffron soaked milk and Allow to cook until cooked well. Keep it cool & make a round size balls. Take the dough just stretch it & Place the coconut mix in centre and cove the dough. Dust the flour & roll with rolling pin like a stuffed paratha. Heat the tawa & grease with ghee. 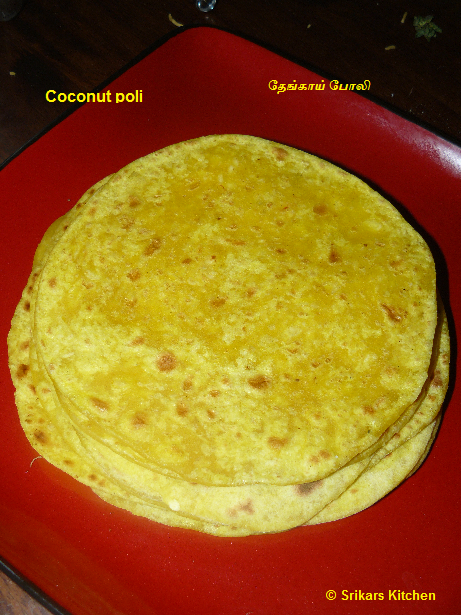 Add rolled coconut poli in tawa & cook it both sides. Brush with ghee in both sides & serve hot. U have made it perfect !